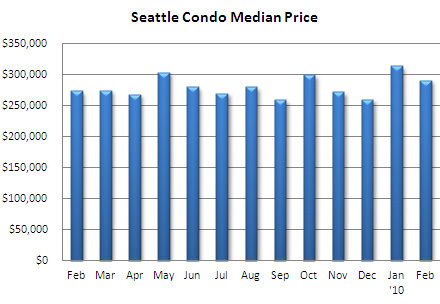 February’s median Seattle condo price of $290,500 highlighted only the second year-over-year increase in the past 12 months, up 6% over the median price last February. Though, it did slip 7.4% from January. Given that sales were weighted towards the lower price points (54% of all condo sales were priced below $300,000), it’s good to see that values rose over the same period last year. Inventory increased as expected, up 8.7% over January and 1.9% above last February. 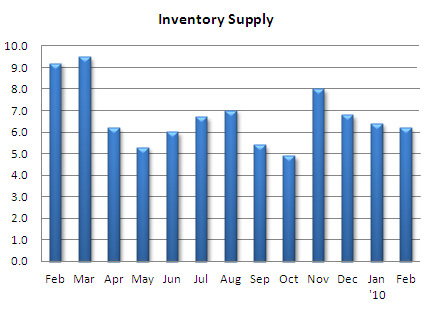 However, the inventory supply rate dipped to 6.2 months of supply. When factoring in the phantom inventory of unlisted new construction condos, the rate rises to 8.8 months of supply citywide. 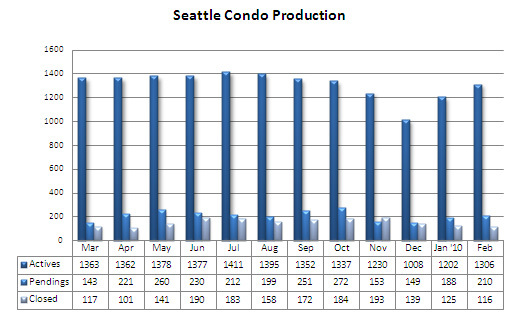 Though, in the Belltown/Downtown area, the rate shoots up from 7.8 to a 21-month supply. 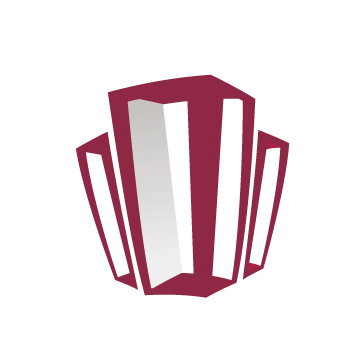 The number of pending transactions rose 51.1% over last February and 11.7% above January, fueled by the robust sales of affordable condos and the tax credit incentive. Closed sales also increased 18.4% compared to last February, but down slightly from January. In respects to the chart below, the two principal condo marketing firms have misclassified buildings on Capitol Hill (1111 E. Pike) and lower Queen Anne (Marselle) in downtown/Belltown, skewing the Area 701 figures. Adjusting for the misclassification, Area 701’s median price was $400,000 last month instead of $360,000. 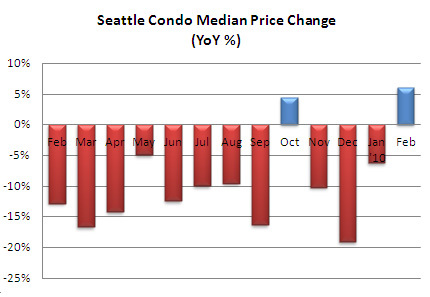 Therefore, year-over-year median price change should be -3.6% rather than -13.3%. A 51.1% rise of pending transactions over last February is quite impressive. Of course we in Austin are noticing that getting financing for our condos is the biggest hurdle, especially new condos now that so many buyers want to go FHA. I think that factor affects sales more than supply etc. These are great graphs – thank you for sharing. Thanks for the great information about the Seattle market. 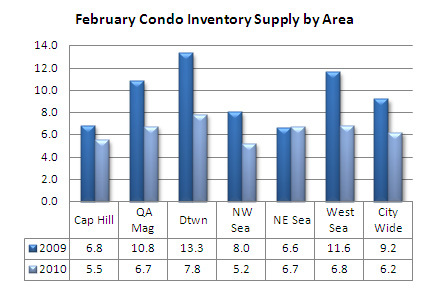 We are seeing similar numbers here, although our inventory is more indicative of a transitional market (6 month supply). I look forward to your March statistics and see how they compare to the ones here in Maui.